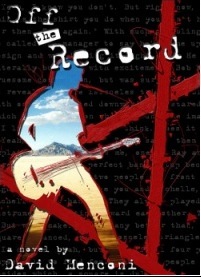 “Off The Record” is a novel, published in 2000 by iUniverse. A roman-a-clef set in the music business, it’s basically a notebook dump where I worked in every fantastic, lurid bit of rumors, gossip, lies and dreams that I could. Find it on amazon.com, iTunes or bn.com. Check out the multi-media trailer, by my multi-talented brother Andy Menconi (who also designed the book cover). I bought this books ages ago, but seem to remember there being a blog associated with it at first. Am I remembering right? Kind of! It was a fake fansite for the band. I’ve not updated it in ages, but it’s still out there.